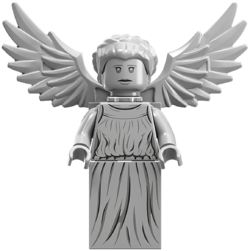 A Weeping Angel is a minifigure that appears in 21304 Doctor Who. Weeping Angel is colored medium stone grey with dark grey eyes, lips and folds of garment. Black is also used in detail lines of garment. She has short medium stone grey hair, which is tied in a low bun. Her face is double sided; with one side having a calm expression and another showing her demonic side. She also has medium stone grey wings attached to her back via a transparent neck bracket with two studs, one for each wing. Weeping Angels were enemies of The Doctor. When someone was not looking at them or were unable to see them, the Angels moved almost instantaneously, sending them back in time with a single touch. Following this, the aliens fed off the energy of the time their victims would have lived. The Doctor first met them i his tenth incarnation when he and his companion Martha got touched by them and had to contact one Sally Sparrow in the future through easter eggs on DVDs. Ultimately, the Doctor defeated them by tricking them into looking at each other so that they turned to stone for eternity.